Could This Be Robert Louis Stevenson? "You think dogs will not be in heaven? I tell you, they will be there long before any of us." When I first started collecting photographs, I was an impulse buyer. I soon found impulse buying emptied the bank account and left my photographic collection with no direction. I soon decided to collect a specific category of photograph; men/boys and their dogs. It didn't take long to discover I had stepped into a category of collecting where there was established and fierce competition. I collected only a few men/boys before I determined it was not the category for me. Those photographs I collected, I love. I've chosen the first cabinet card collected in this category as my submission for All Creatures Great and Small, the 13th Edition of Smile For The Camera. 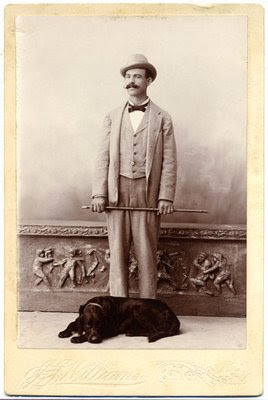 There is no identification on the cabinet card as to the name of the man and dog pictured. The back of the card is blank. The photographer is identified as J.J. Williams, Honolulu, H.I. James J. Williams was born in England in 1853. His family came to American, but it is unknown when. After the Civil War he ran away from home to study a new rage called photography. He played the violin as a sideline. He worked his way west to San Francisco. Hawaiian Island photographers imported supplies and recruited photographers from the better known San Francisco galleries. James J. Williams arrived in Honolulu from Sydney in 1880. He had passed through the islands in 1879 from San Francisco where he worked for photographers I.W. Taber and Jacob Shew. He fiddled his way to Honolulu by playing music on a ship for the entertainment of the passengers. In 1878, at the age of 25, he returned to Honolulu and worked in the studio of Menzies Dickson (ca. 1840-1891), buying the business and changing the name to J.J. Williams Studio in 1883. King Kalakaua, the monarch at that time, was impressed by the factual way that readers of Paradise of the Pacific were informed about Hawaii and so he sent copies to the Hawaiian consuls in foreign cities. As the Journal of the Kingdom, the King granted Paradise free postage to any foreign destination. Later Kalakaua provided public funds to wrap the paper in a cover. James J. Williams died on April 19, 1926 when he was hit by a streetcar while crossing Hotel Street; one of the streetcars he often photographed. 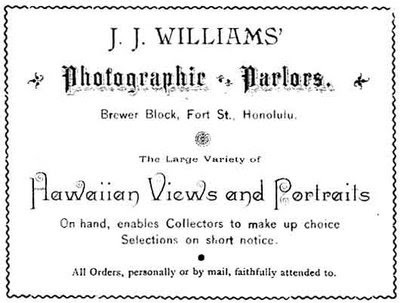 He had operated the J.J. Williams Studio for 40 years and had a rare collection of early photos of Hawaii. 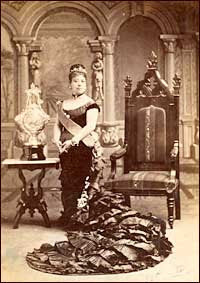 Williams had taken photographs of Robert Louis Stevenson, King Kalakaua and most of the Hawaiian Royal family (pictured above Queen Emma at Iolani Palace). The studio still exists, being run by Alex Williams, J.J.'s great grandson. 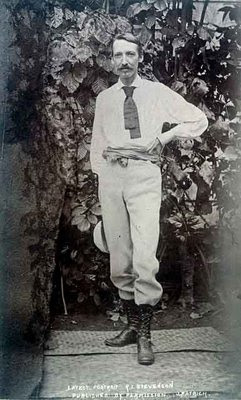 Williams photographed Robert Louis Stevenson. 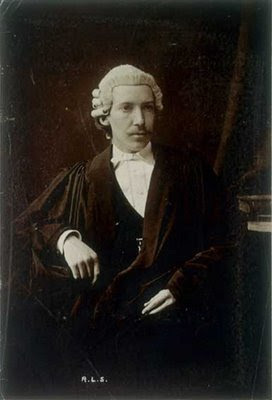 The man in my photograph resembles Stevenson as he appears in the photograph above. So I wondered, is my photograph of Robert Louis Stevenson? The answer is a resounding - No! I wish it was, as Treasure Island was my favorite book as a child. Williams operated in the same location, Fort Street, from 1883 until 1926 as the J.J. Williams Studio. Therefore, this photograph embossed J.J. Williams was taken sometime between 1883 and 1926. The clothing worn by the man in the photograph dates from the mid to late 1890s. My research of the Homburg hat, tie, collar, haircut, and suit style confirm this period of time. Stevenson wore a wedding ring. The man in my photograph does not. Photographs of Stevenson do not show him wearing jewelry. The man in my photograph does. Stevenson died very suddenly, one evening in December 1894. He had been ill for some time and photographs taken of him, such as the one above, evidence that illness. This photograph just before his death shows an extremely thin man. My photograph shows a very healthy man. My unknown man is either a wealthy local, or a tourist who may have dropped into the studio to purchase one of the many photographs Williams sold of life in Hawaii, stopping to have his portrait and that of his faithful companion taken. While the two men resemble one another, it is more an indication of the style of the time than it is the men themselves. Oh, and the dog is a lovely Irish Red Setter. Dye, Bob. Hawai'i chronicles III : World War Two in Hawai'i, from the pages of Paradise of the Pacific. Honolulu: University of Hawai'i Press. 2000. Harrington, Daniel. Hawaiian Encyclopedia A Comprehensive Guide To The Hawaiian Islands. Kelley, Darlene E. Historical Collections of Hawai'i Keepers of the Culture A Study in Time, of the Hawai'ian Islands. Bacchilega, Cristina. Legendary Hawai'i and The Politics of Place. Philadelphia : University of Pennsylvania Press. 2007. Honolulu Advertiser 19 April 1926. Kuykendall, Ralph S. Hawaiian Kingdom 1874-1893, the Kalakaua Dynastism. Honolulu : Univ. Press of Hawaii. 1967. Man and Dog. J. J. Williams. Honolulu, H.I. Cabinet Card. Unknown. Privately held by the footnoteMaven, Preston, WA. 2009. I always learn so much from your articles, footmaven! Not just the content but how you can weave an article around an image. I agree with Evelyn, I learn so much from your articles. Where do you learn so much about the photographers? I just love the way they seem to help identify the photos. I find that one of the best and most reliable clues to dating a photograph comes from the photographer. I have a great library and do a lot of research. Plus the web is an amazing research tool! Smile For The Camera Extension! Looking For Weekend With Shades?